Cheryl is an internationally recognized master of the art form of Fine Art Freehand Machine Embroidery (FAFME) creating portraits , fantasy pieces, animals and landscapes. Inspirations come from her dreams, nature and life. Cheryl has exhibited, taught and has works in collections in UK, USA, Asia and Australasia. Cheryl lives works and plays in a 159 year old horse stables in down town Adelaide. Cheryl begins with a blank canvas. She does not draw on the canvas. No painting, photography, projectors or computers are involved. Threading a fine needle Cheryl creates exquisitely detailed freehand embroideries on canvas, paper & one-off garments. Her art is instantly recognizable with emotive qualities and subconcious dream elements. She believes in being proud to sign her name on the best original art she creates. Her love of drawing is a love of the tactile drawn stitch -hence she is passionate about free embroidery. Experimentation with new ideas & innovations is part of her practice. Detailed visual diaries filled with drawings, from life & her vivid dreams, to use as reference to create and tell her visual narratives in free thread stitching. She has a solo art exhibition every year since 2010. Her journey, life & dreams feature in her art., e.g. Top Cocky & Kiwi Culture (images below) tell a travelling story. 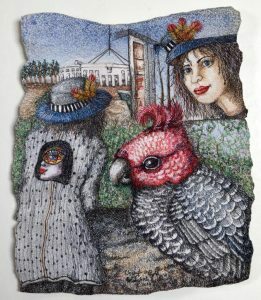 They were created live in Canberra & NZ with herself depicted as a cartoon in each, wearing her latest embroidered outfit. ( She only wears her own designed and always embroidered tailored outfits every day). She takes the foot off of a standard sewing machine and creates her masterpieces using her hands and thread only.